Make-A-Wish requests often involve meeting athletes, attending sporting events or traveling to amusement parks or beaches. When it came time for 11-year-old Brett Haubrich of south St. Louis County to make his wish, he not only listed none of those things but had no request at all. The answer to the last question became part of his wish — what Make-A-Wish calls “wish enhancement” to complement the main wish. The sixth-grader at St. Mark School wants to be a priest, a doctor or an engineer, in that order. “I said, ‘I really want to be a priest,'” he said. Brett served not one but two Masses — the Chrism Mass and the evening Mass of the Lord’s Supper — and held the book for Archbishop Carlson for prayers after the homilies. 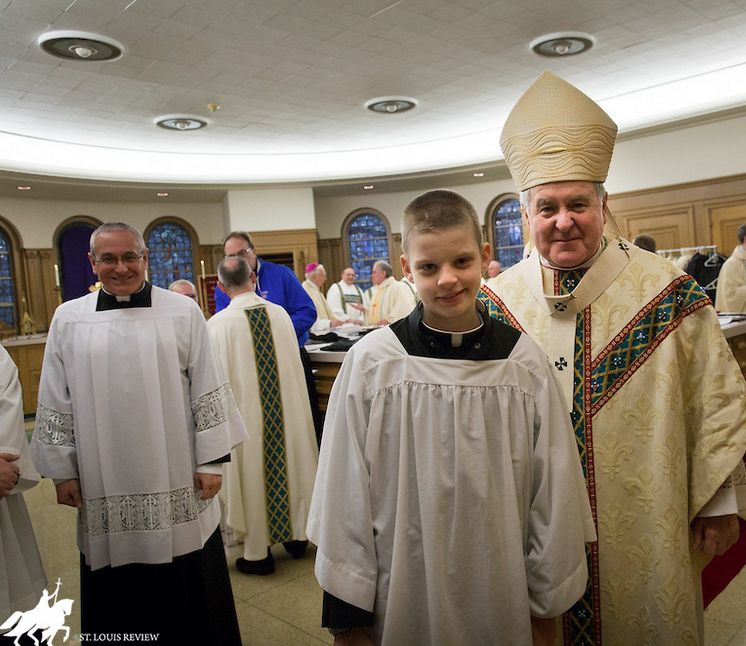 At the evening Mass, he was with 11 seminarians having their feet washed by Archbishop Carlson, and his parents brought up the gifts of bread and wine. “Just a really cool experience,” he said. “Eating mangoes on a beach,” his mother said. That trip will come later. His interim “priest-for-a-day” request didn’t surprise his family. The second of Eileen and Conrad’s four children and oldest of two sons, Brett has served at his school church and at his parish, St. Martin of Tours, which is visible from the back door of his house only a short walk away. Father Smith prepared an itinerary and delivered it in person along with a letter signed by Archbishop Carlson asking for Brett’s help at the Masses. “He did pretty well,” Archbishop Carlson said. Pretty cool eh?!? What can you do to inspire vocations and help instill a love of the Mass, Liturgy, Christ, and his church in our youth? How can we help others to join us in walking this Way of Beauty even closer?